Eight non-airline international investors have sent in expressions of interest (EoI) to take over the management of SriLankan Airlines, and following discussions over the next few months, a transaction is likely to take place around mid-2017, a top Government spokesman said yesterday. Addressing the media on issues relating to the crisis-riddled national carrier, State Enterprise Development Deputy Minister Eran Wickramaratne said that the interested investors will be shortlisted to two or three names before the end of this year. “We will then see whether those investors’ interests and our interests actually coincide. If they do, then we’ll go down the road with one of the investors in concluding a transaction,” said Wickramaratne. Preliminary discussions should lead to a single name by March or April next year said the Deputy Minister, pointing at a rough timeline for signing the final agreement. In the event this process does not bear fruit, the airline will still have achieved something he said, referring to the ongoing restructuring of the carrier, in terms of route rationalisation and fleet rationalisation aimed at bringing down losses and making it more efficient. Two major decisions had to be made in the process, one being the amalgamation of the massively loss-making budget airline Mihin Lanka with SriLankan Airlines. “It doesn’t make sense for a small country with a capital shortage to actually be trying to make two airlines successful, hence the amalgamation of the operations that’s already in progress,” said Wickramaratne. “It’s an amalgamation, not a merger. So the Government will continue to own the Mihin Lanka license, but [there will be] no operations. And the amalgamation will go ahead,” he added. The Deputy Minister blamed the problems faced by the airline on large scale corruption, with particular emphasis on the purchase of Airbus A330 and A350 aircraft, to which the airline had committed a total of Rs. 143 b. An A350 aircraft could be leased for about $ 900,000 a month (the Airbus website lists the current price of an A350 at $ 272.4 million), but according to Wickramaratne, SriLankan had contracted around $ 1.4 m a month, losing roughly half a million dollars per month over a period of 12 years. “A simple calculation will reveal that it’s about $ 72 million per aircraft. You can conclude for sure that there was corruption just by looking at the magnitude,” he said. However, between concluding that there was corruption and trying to figure out who actually stole the money, the investigations should take a while. “The chairman and the board are definitely responsible,” said Wickramaratne. “There should be an outcry - like how there is an outcry about the Central Bank - that maybe these people should be brought to book in the public domain,” he added. The Deputy Minister went on to say that the money lost due to the bond scam was nothing compared to the unprecedented numbers involved in this case. Assuming that the Government lost Rs. 10 b as a result of the bond issue, it pales in comparison to the Rs. 14.5 b lost in the A350 transaction, he said. “SriLankan Airlines just contracted to lay off three of the A350 aircraft, to lay it off, not to take it on for 12 years with a liability of $ 98m. That is roughly Rs 14.5 b just on that. And there are lots more transactions in there,” he added. 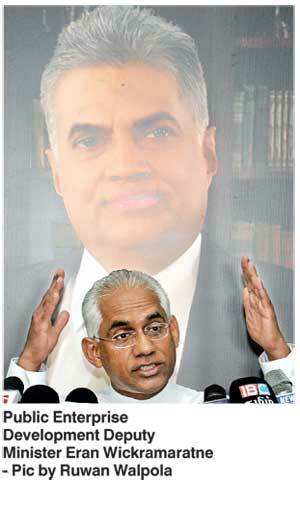 Wickramaratne said the Government is going to pursue the controversial Weliamuna report, going forward. “The Weliamuna report pointed to some of these things and the SriLankan Airlines management has taken responsibility for some of the management issues and are trying to put it right,” he said. “We have responsibility not as individuals - individuals will come and go, but corporate entities have continuous life and people need to understand that. Therefore, the board of SriLankan Arilines has to take responsibility in investigating and in bringing to book those who have taken it,” he added.